For more than a month we ran a Blackjack competition for who would be the first to receive four Blackjacks (Ace and a Ten value card) in a row. It was a hard task and from the beginning to the end of the contest, players made 213,965 bets! The chances of getting four Blackjacks in a row are 1:195,286, so it finished almost right on time! Minimum bet was 100 credits on all bets. PlayMoney bets were not counted. Blackjack BetID had to be 486483 or higher. 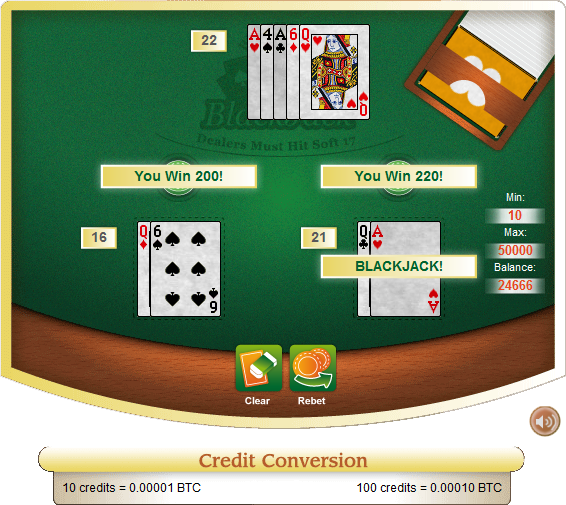 If player split their hand and received Blackjack on both hands, it counted as two blackjacks. When player split their hand, one Blackjack was counted as well. We started with a reward of 0.05 Bitcoin, but increased it all the way to 0.2 Bitcoin. He received two Blackjacks in his first hand and got lucky on his second and third hands. We gave him 0.2 Bitcoin as promised. Congratulations again from the Crypto-Games team!